Snow kept Nipun Mehta from making it to Franklin & Marshall College on March 22, but the founder of ServiceSpace still tuned in to speak at Common Hour, a community discussion conducted every Thursday classes are in session. Sophie Wu, a senior religious studies major from Shanghai, China, who proposed the event, introduced Mehta and his work through a video of Mehta’s talk at University of California-Berkeley's Greater Good Science Center in 2014. “Gratitude is generative,” Mehta said in the video. Mehta's many awards include the Jefferson Award for Public Service and Dalai Lama's Unsung Hero of Compassion. In 2015, President Barack Obama appointed him to a council on poverty and inequality. In 1999, Mehta co-founded ServiceSpace, an incubator of projects that operate at the intersection of volunteerism, technology and gift-economy with the goal of igniting generosity through small acts of kindness. What started as an experiment with four friends grew to a global ecosystem of more than 500,000 members that has delivered millions of dollars in service for free. One ServiceSpace project is Karma Kitchen in Berkeley, a pay-it-forward restaurant run by volunteers. Guests are invited to contribute for those dining after them. 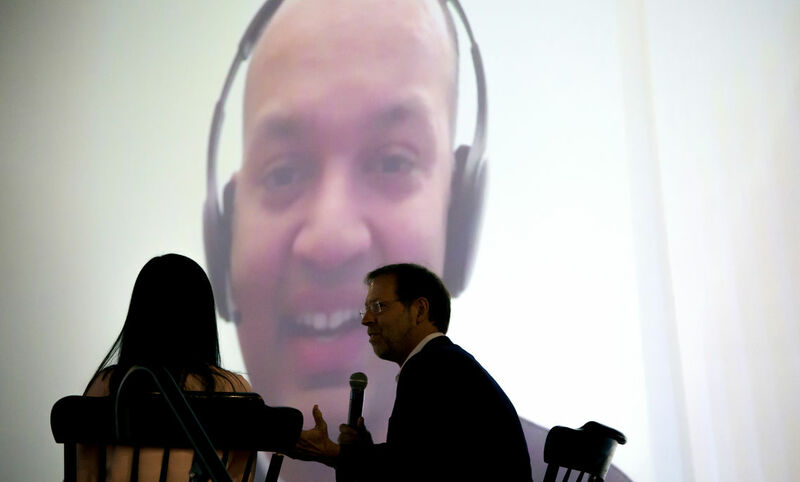 Mehta joined the large audience in Mayser Gymnasium through a video call. He told the story of his own transformation, a shift from being success-oriented to service-oriented. In 2005, Mehta and his wife sold their belongings and committed to spend a year walking through India relying on the generosity of others. “If you can’t generate love and compassion, you won’t serve. If you won’t serve, you won’t create relationships. And if you don’t have relationships, have fun sleeping on the ground,” said Mehta. Following his remarks, F&M President Daniel R. Porterfield and Wu appeared on stage. They engaged Mehta in a question and answer session with students from the audience. Mehta encouraged the audience to meditate and find the stillness in the present moment and to give often and in creative ways, not always focusing on the materialistic.